Update 1: More examples of these problems are popping up. I've added them to the gallery. hour tomorrow to get a new one. Thanks apple! within an hour of setting it up i noticed the same problem on my handset. - no second guessing or questions. in's on the early models rushed out today. maybe i can swap it for a white one then? Update 4: More reports coming in. One with picture. Got mine today. Till I saw the post on Giz, I probably wouldn't have noticed it on mine. Might not even be able to see it on the pic, but it is there. Not too bad. And only really tell so far with flashlight on. But yeah, its there. Fourteen people have reported this problem at the time of this update. Update 5: Another reader sent his account along with an image. Here is the yellow band on my iPhone. Sometimes it's not as noticeable but after using it for a few minutes my eyes seem to adjust and its glaringly obvious. Subject: iPhone 4 Screen Yellowing? confirm that I too am having this problem. life). Is this a common issue? Update 7: More spots from a new case. My iPhone arrived today with two yellow spots at the bottom left. I've been in contact with Apple...they don't seem to have any answers for the issue yet. On a side note, my service goes from full bars to one or two without cause. Ahh, the adventures of buying an Apple device on day one. Update 8: One more case and one more picture. We have another (so sad!!!). Update 9: Received new cases and some new photos from readers Tovi Stigger, Dan Paliotta, Johny Hernandez, Santhosh Krishnamurthy, William Duncanson, John Howarth, Scott Story, and Tim Della Maggiore, all with the same problem. This puts the total numbers of cases so far in 27. I'm still waiting for my iPhone 4's activation but I looked and I can see five spots on my screen that's been yellowed. I saw where there are reported cases of this issue. Mine has it too. I was able to temporarily fix it by putting the iPhone over an air vent, and putting the top of the box over it to direct airflow to the iPhone. It went away for about 5 minutes. Then slowly but surely came back. Apple will be replacing mine soon. But that rules out the fact of it being the LCD itself. I just thought I would share that. Glad I'm not the only one with this problem. I was shocked to find this many dead pixels. This was fresh out of the box. It looks like a constellation. I have a discoloration about the size of a dime. I guess I'm fortunate compared to other people. Now I have to debate when to go in to get a replacement. Yellow spots at bottom right and slightly to right of left edge at bottom. Subject: iPhone 4 yellow display issue. I too have yellow spots as referenced on your post at gizmodo.com. Mine appear in both the lower left and right corners. I only noticed the left corner at first, then I loaded up the graphic you put in the post and noticed the second one in the lower right. Going to call Apple Care and see what they have to say. Update 16: We're starting to see more photos coming in again. Update 17: This morning the inbox was loaded with more yellow tint problems accounts and images. Subject: My screen is half yellow! Half my damn screen is yellow! My buddy Lue Lynx has the same problem too, I should have spent the price of the iPhone on a new pair of jeans. I didn't do well taking the picture, but it's on the left hand side going vertical on my iPhone 4 which I just got today. I'm not sure who to even contact or when to go to my Apple store. I am off Friday, so I'm guessing that'll be the best thing to do and just see what they say. Hey Same problem here. I didnt even notice till I saw the post on your site. Got mine today and sure enough yellow band and a few yellow spots. Im sure Apple is on this and will fix this eventually! I think what were seeing here is an unfortunate effect caused from the new process in which they adhere the glass panel to the LCD/digitizer. They sort of talk about it in the promotional video and judging by the perfect lines/dots it's probably how the machining process drops the adhesive. It's probable that it will fade over time as the screens continue to warm and cool and become more "used". Update 19: There's another kind of display problem detected by two readers so far. Instead of the yellow dots, there's some white spots randomly distributed over the screen, resembling a constellation of stars. I don't know if others are having this issue, but I have a constellation of blown pixels or something in my iPhone 4 screen. when on white. This is how it was out of the box under the protective film. I had major yellow spots on the bottom corners of the iPhone 4 this morning when I received it (as shown in the other thread) and as of right now they have COMPLETELY faded away. I have no idea what caused this but it happened. So keep an eye on it over the next day or so if you have the issue. There are no more reported cases of the yellow tint going away, however. If you reported this problem to us, check if the problem is gone and get back to us here. After i read your article about screen discoloration i quickly check mine and sure it is two yellowish spots bottom right hand corner and on the center. I called apple store today and they agreed to swap my iphone with a new one. 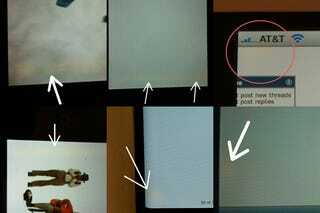 The first iphone they swap has no yellow discoloration however there is a speck of black spot on the lower left corner. The apple employee also said it was under the screen. GREAT!!! i spent an hour ani d a half in the apple store dealing with this problem. He quickly replaced it with a new one and thank god it has no problem so far. I even asked him to check the call drop (he called the apple store and hold the metal sides, especially the left one) and it works. I hope there isn't this much problem for everyone. Update 24: Brian Lam says that his iPhone doesn't have the yellow tint problem. Update 25: Reader Jason Houghton is writing to report that Apple has exchanged his phone. Once again, Apple support didn't mention about the alleged adhesive requiring some time to fade. I cued up at 5am this morning in the UK, and after a long 6 hours waiting I got my phone. I took it home to find a yellow band down the left side of the screen. I phoned apple care and they said that they are aware of this issue and are forwarding it onto their engineering team. The advisor then said one of their superior engineers wanted to speak to me about it. He asked me for photos, I sent them, and he explained apple are working on the issue right now. He advised I go back to the apple store where I bought it and they will fix it. So I did just that this evening and there was still a massive cue. I completely skipped it. Went to the genius bar and they replaced it for a new iPhone 4. I was only there for two minutes. This is the replacement iPhone I am mailing from right now and it's screen is perfect. It also seems whiter. They took the replacement out of a black plastic case, different to how they replaced my 3GS. My point is that apple will happily replace your IPhone if you are unlucky enough to have this issue. Update 26: Apple support has told one of our readers that the problem is the adhesive, advising to wait. Read about it here. Apple Support Says iPhone 4 Yellow Tint Problem Is "Residue From Manufacturing"
Update 27: Other readers have said that Apple have directed them to replace their iPhones. There may be some confusion at Apple tech support at this point. Could this be the start of another yellow tint display problem saga, like with the latest iMac? We learnt back then than making ultra-high density displays is hard and problematic, but it's too early to tell. If you are you experiencing these problems in your iPhone 4, send your photos or videos to jesus@gizmodo.com. Click to viewAlso, send us all your other iPhone 4 experiences, bad or good, for our crowdsourced iPhone 4 review.